With bookings that are completed on GigSalad, your client pays both the deposit and balance in one simple transaction. The deposit payment is sent to you in advance, but the balance payment is held until 1-2 business days after the event. (You can read more about payouts here.) Collecting full payments up front simplifies the booking process and allows us to offer extra booking protection to both you and the client. You can rest easy knowing your money is guaranteed, and you won't have to worry about chasing down payments before, during, or after the gig. We've got you covered! Because we facilitate both deposits and balance payments, it's important that we know how much you are owed if a client cancels their event. Within each quote you send, there is a cancellation policy option to choose for that event. You can select our recommended default policy or choose to customize your own. A customized policy allows you to select a refund window for your deposit and/or balance payment, which protects you in the event of a client cancellation. You can save or update your preferred cancellation policy at any time through your control panel. Just go to Edit PromoKit, select Quote Settings from the menu, and then click Cancellation Policy. After studying results from a member survey, we found the most common preferences for cancellation refunds and used that to determine our default cancellation policy. For the most common cancellation preferences, use the default cancellation policy. If you do not have a saved cancellation policy when you send your first quote, our recommended cancellation policy will be selected by default, and you can edit it at that time if needed. Doing so will save that as your customized policy for all future quotes. You can go back to your Quote Settings to change it at any time. If you would like a more gracious or strict policy than our default option, then you can choose to customize your cancellation policy to fit your needs. Customize your cancellation policy to have a more gracious or strict policy that suits your business. 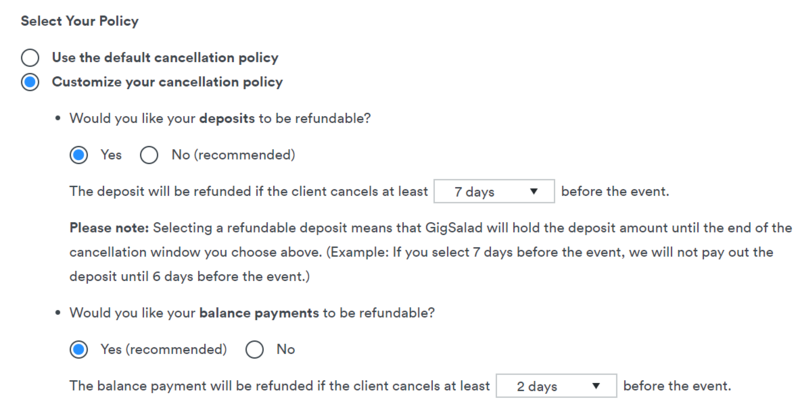 Because GigSalad accepts your client's payments in full, you will choose under which circumstances you are willing to forfeit each payment (the deposit and the balance) if the client cancels the event. You may choose to make one or both payments non-refundable, in which case you would be guaranteed those funds whether or not your client cancels their event. Or if you prefer a less strict policy, you may choose to make one or both payments refundable within a specified cancellation window. When you select the refundable option for either payment, you must then select the amount of time before an event the client must cancel in order to receive a refund for that payment. When customizing your policy, select a number of days before an event a client can cancel to receive a refund. As stated in the note on the page, if you choose to offer a refundable deposit then you will not receive that payment until the end of your chosen cancellation window. As long as funds are available for refund, GigSalad must hold them so that we can honor that refund if the client cancels. For example, if you choose to make your deposit refundable if the client cancels at least 14 days before the event, then we will hold that payment until that point and send your payment 13 days before the event. If 13 days before the event lands on a weekend day or holiday, we'll issue your payment the next business day. Depending on your payout method, you'll have these funds in your receiving account within 1 business day after we have sent them. If you want to receive your deposit payments sooner, then you must choose a larger cancellation window or a non-refundable deposit. Non-refundable deposits will be sent within 1-3 business days after the client accepts your quote and makes a payment. Non-refundable deposits are an industry standard, but requiring balance payments from clients even when they cancel months in advance is a bit strict. This is why we recommend choosing a refundable balance payment. Since GigSalad has already collected the balance, you are guaranteed those funds. However, we will refund them back to the client based on the cancellation window you choose for refundable balance payments. For example, if you choose a 2-day cancellation window, that means we will issue your client a refund of their balance payment if they cancel at least 2 days before the event. If they cancel less than 2 days before the event, then you will receive those funds as planned even though you will no longer be performing the gig. When a client cancels outside of your cancellation window and they must forfeit their balance payment, we will send those funds to you within 1-2 business days after the cancellation is confirmed. What happens if you (the vendor) cancel? If you cancel a gig for any reason, the client is protected by our Worry-Free Guarantee and will receive a full refund of their payment regardless of your stated cancellation policy. If you cancel after you have already received your deposit, you must return those funds to GigSalad right away. Failure to do so will lock you out of your account, and you will no longer receive gig leads or be able to accept bookings. The same is true if we learn at any point that you failed to show up to a gig after we have already released the balance payment to you. You must return that payment or you will be removed from the site. What happened to my old, written cancellation policy? Because full payments are facilitated by GigSalad, we no longer allow members to write their own cancellation policies. With payments in our possession, we are responsible for issuing refunds when cancellations occur. We need to be able to enforce the policy you choose, and we also want to keep our platform consistent and easy to understand for those who book through our site. Can I add my own cancellation policy to my Additional Terms? If you add any other cancellation stipulations to your additional terms that contradict the cancellation policy that was chosen, they will not be enforced by GigSalad. All refunds and payments will be determined only by the cancellation policy selected for that event.